Why drill into the ocean floor? Donated by the Integrated Ocean Drilling Program. In Fall 2005, scientists from the Joint Oceanographic Institute used this drill bit to extract rock samples from the floor of the Pacific Ocean. The small silver bumps are hardened tungsten-carbide “teeth,” able to cut into the toughest rock. Notice how some teeth have worn flat, and others have broken off. The drill rotates around the central hole, producing a long cylinder of rock known as a core. Scientists remove this sample and bring it up to the ship for study. 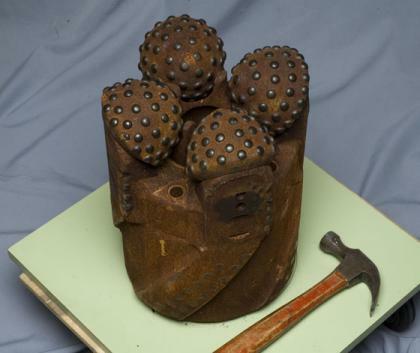 The four smaller holes between the large knobs are jet nozzles, which shoot water onto the drill surface to cool the bit and blow away debris. A group of teachers accompanied the researchers on their 16-day trip, learning how ocean science is done. Bryan Kennedy of the Science Museum was part of the team, and brought back this drill bit for us.